Sometimes you play a game for five minutes, enjoy its kitsch, put it down thinking to yourself, “Gee, what a fun game,” only to return to it with more time and discretion only to find the flaws shine through brighter than the good bits? Skitchin’, developed and published by Electronic Arts for the Sega Genesis in 1994, is a game I’ve recommended to people. Before I started playing it for review, I could not have been more optimistic. “I’ve played this before, and its great! I can’t wait to get back into it,” I thought. Talk about disappointment harbored at my shoes. Hit the jump for your full dose of 90’s hawtness. 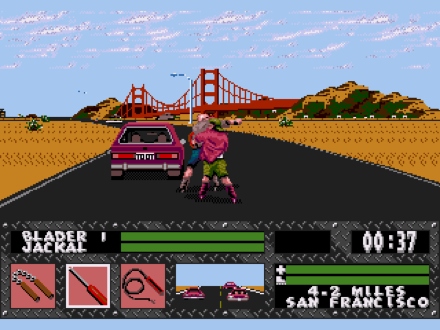 The game play of Skitchin’ remains the same in its many modes. A race begins, you must skitch cars, with means holding onto the bumper and using them to slingshot into first place. Along the way, you can perform tricks off ramps, pick up weapons, beat up opponents, and dodge cars and obstructions. 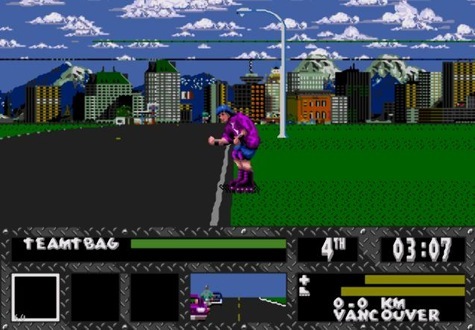 Yes, this game is unmistakably a Road Rash clone. Moments in game play can be categorized into one of two groups: the intended game and the actual game. If the intended game had shone through the rough patches, we would have a very serviceable rip off with a unique mechanic of sketching. The good challenge of the game progresses evenly as you make your way through different cites. Other skaters have greater stamina and hit harder with better weapons. More cars on the road swerve lane to lane, intersections are hairier to get through, and the length of the roads varies. Drivers start to try and shake you off, so you’ll have to duck from the Seeing Eye or their rear-view mirror. Sometimes one of the lanes is closed for blocks at time. These occasions are the right set of circumstances to skitch a car for a while and let your competitors either get wailed by traffic or beat them to a pulp as they try and cling near you. Slingshots off of enough cars and you are rewarded with some serious speed. Skitchin’ can be very fun and quite enjoyable at times. Unfortunately, the fun of Skitchin’ is overshadowed by the nearly intangible problems that sink the game. The game has serious issues with the Matthew Effect. The outcome the race is decided within the first minute. If you catch the right breaks, skitch the first car, and maybe an opponent or two wipes out right away, you can sail to victory with relative ease in the early levels. But if a car hits you within thirty seconds, might as well hit reset and enter in the lengthy password. Worse is during the race, cars can hit you multiple times in a row without much warning, making your stress multiply within a moment. Controls are loose, unresponsive, and sometimes don’t work the way you plan. Say a car is coming up on your right; you’ll naturally want to lean right to grab hold. Half the time you’ll lean left even though you are holding right on the D-pad. Your automatic response is to correct this error and hammer down on right, only to switch as soon as the car passes you by. Most of the time the next car is on the opposite side so you try and reset again only to just miss once more. This vicious cycle can repeats until a fleet of Oldsmobile’s streak past, blowing dust into your tears. Multiplayer modes only enhance the flaws of the game. There’s alternating, competitive, head to head, and tournament if you feel like torturing up to eight players. By having more players, issues arrive more frequently than in the single player mode. Multiplayer is a great way to assure you’ll have to buy new controllers because the odds are increased that someone, possibly you, will be whipping them across the room powered by a rage induced by unfair hits by cars and trucks. The layout gets even worse in multiplayer, with the diamond-print wrapped around the entire screen. It feels like your playing the game through prison cell with how many bars surround the action. Maybe that’s just another ploy into fooling us of it’s tough as nails, cool as ice reputation the game tries to play up so desperately. The phony outsider image of Skitchin’ eventually grinds your nerves finer than silt. At first amusing like Joel Schumacher’s The Lost Boys, your merriment will begin to wane as you realize the wool hats, giant tee shirts, and floppy hairstyles do nothing to add any true value to the game. The worst is the guy you buy your gear from, with his round Lennon sunglasses, skeleton tee, and thumbs up. Music is pulsating guitar mucus that can thankfully be turned off, the best option in the game. Everyone is named Fester, Karcass, Thrasher, or something else just as “extreme” and morbid. Billboards you rocket have slogans such as “Buy Things” and “Eat Wax. Yum!” do their best to act as a sort of social commentary against commercialism, but its odd for a game made by EA. This paragraph brought to you by Louis Virtel. Like your tweets with a bit of bite and a few celebrity guests? Follow him at www.twitter.com/louisvirtel. Back to the review. The Head Up Display is a mess, with meters for stamina, gear, health, inventory slots for weapons, a rear view mirror, time, distance to goal, locale, and placement, all framed within diamond-tread steel and located on the lower third of the screen. My real problem with this isn’t a lot of useless information, but how it skwishes the action into the top two thirds of the screen. Your character is viewed from the back dead on, blocking whatever’s in front of you including cars, other racers, and most importantly weapons. Weapons include pipes, chains, crowbars, nunchucks, and cattle prods. You can either scoop them up as you skate or sometimes steal them from your opponent when they try and bash you. The cattle prod, my favorite, shocks opponents, making their skeletons glow and throb within a silhouetted body. Weapons are essential in later levels when the difficultly increases and baddies get stronger. But collecting them is challenging mostly because you cannot see them. If your not blocking from view with your body, they potentially could be glitch flashing in and out of existence. Bonus course’s let you focus on one aspect of the game while you earn some extra dollars. These are the most fun because honing in on the certain style of game play highlights how fun the came can be, or should I say could have been. On a trick course, you rack up dollars the more stunts you perform. Speed course is all about how fast you can go. Chase course has you trying to catch and thrash an opponent. You try to hold on to a van and beat up multiple people during King of the Bus. My favorite of the bonuses, it allows ample opportunity to try out your collection of weapons. Courses are too similar. The only distinguishable differences between levels are city skyline in the distance. Every area is either empty gray or (notice I didn’t use “and”) brown deserts or the most immaculately kept acres of lawn in the history of man, in which case kudos to caretakers. Buildings are out in the open, with sidewalks, parking lots, parked cars, nor people anywhere in site. Most of the levels have a glitchy line running through the skyline as well. Cars and obstructions also can become invisible and act buggy. Two of the worst examples are when I was greeted to a sudden stop (i.e. laid out) by nothing, only to see a boxcar appear out of nowhere. A BOXCAR! The other is once I skitched on a jeep to have it stop in an intersection for no apparent reason. At first I couldn’t let go until the controls let me, then I couldn’t skate around it. See, you can only skate forward and not really move to the side when you have no forward momentum. I couldn’t move at all so I had to turn it off. Alas, I had to power on again to keep reviewing. Luckily, you don’t have to. Skitchin’ gets a C- for being a poser. A bad clone game that’s fun moments are drowned in awful controls and frustrating game play. Get a chain and trash the cartridge to pieces. RADICAL!